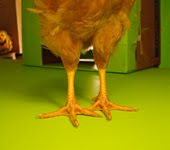 Production Notes: We finished setting up the green screen area to shoot the next batch of footage with our star chicken. What an experience! 1- Chickens don’t walk in a straight line…except when the camera is not rolling. 2- When the camera is rolling, chickens prefer to preen rather than perform. The hens enjoyed the experience much more than we did. But then we discovered spaghetti. There’s nothing like a wet, wiggly worm-like piece of spaghetti to get your actors to move from point A to point B without hesitation or complaint.